hello guys, if I got what you posted right, I will need to put my ptc before battery +, is it right? in my application I use only one battery and PTN04050C, are there any reccomendation? Would two of these be suitable for use (connecting in parallel) for an OKR-T/6? And I place them straight after the + connector of the batteries, correct? If 2x in parallel, for the T6 you would need 2x 3A fuses. And yes, you wire the fuse right after the batt +. That question looked rather silly, as I forgot to add the link I meant to! The main goal for using two parallel PTC's are to achieve lower "Internal Resistance". If you can find a LOW internal resistance in a single fuse than go for it. Also size, they get pretty big when the hold currents get up there. 2 x 3A in parallel it is. I'm guessing 16V is fine, as the max input voltage for 2 cells is 8.4V right? Max cell voltage is 8.4V so yeah, 16V is good. The voltage rating is something you do have to check. The much smaller SMD ones can be rated as low as 6V which is too low for series cells. Most of the leaded ones are 16V and higher. Thanks for the info pretiose shown here! Please tell me, for a DNA 20D, which fuses from below are best mounted, A, B, or C? A can C are non-resetable fuses so you'd have to replace those if they blow. Otherwise they would work and the 7A rating is correct. B is the resetable type that automatically resets after a fault clears. That would be the preferable type, but that one's quite large. You can get away with a 6A or even a 5A hold fuse on that one and it would get the size down a lot, but then the resistance is higher. This is the issue with PTC fuses that makes selecting them rather involved. The leaded ones are generally large. The SMD ones are a lot smaller. Thanks CraigHB! So PTC has all the qualities, just as large in size. I will try to install the one from point A, if it burns it can change. This sounds great to me. I'm going to be making my first mod (DNA 30) and I'm using 2 li-poly batteries. I like the idea of just having the two positive sides on both together. I still haven't figured out everything that goes into connecting the batteries. Even when I figure it all out I know I'm going to be convinced that I'm still missing something. Anyway, a couple days after getting the batteries I laid them in a metal dish of sorts while I was looking for another part. 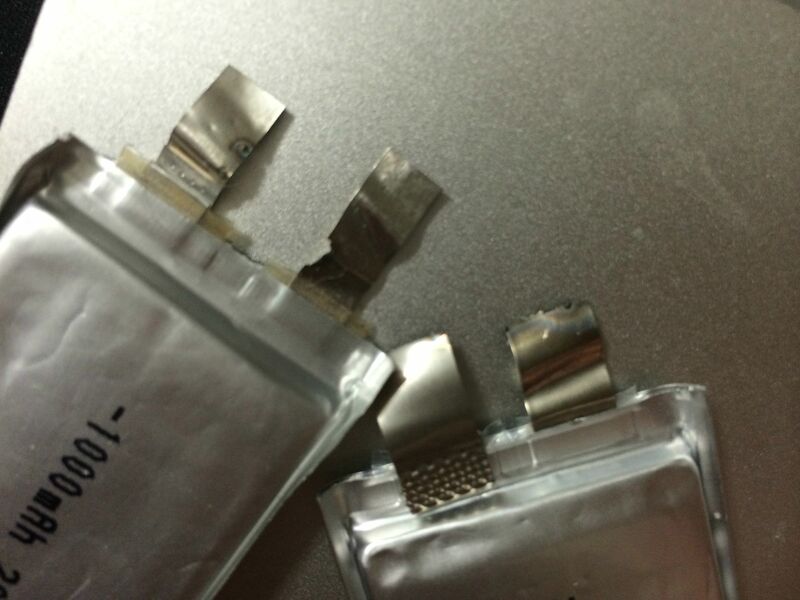 The tabs touched the metal and sparked until I had the chance to grab the batteries and pull them off the surface. Does this mean they're ruined? This is what it looks like. I wasn't sure if I should still be using them or not. Total eek factor that you put the batts in a metal container. There may be differing opinions on this, but I wouldn't use them. You don't know what's stable or not now and it's always better to be safe than sorry. Thanks, that's what I figured. I wasn't paying attention when I put it down. It's 1am here but I will be checking that tutorial tomorrow. Thanks again! Nah, they're fine. Although I make every effort to avoid it, I've done that inadvertently a few times on the cell I use for testing. It's none the worse for wear. Now, if they short for anything longer than an instantaneous moment, it will damage them. In that case the contacts would be completely melted. It comes down to the heat. As long as the plates and contacts inside don't get too hot they're fine. They can put out a couple hundred Amps for a small fraction of a second without damage. Startles the hell out of you when it happens though. I normally put some tape over the positive contact when I'm not using them. That's one thing about those damn tabs, really easy to short them. On the other hand, if you want to be most prudent, then you should replace them. You can still use them for testing. There's probably no internal damage since shorts always burn at one particular part of the circuit. Since the tabs are burned, the inside of the cell is likely not burned, the operative word being likely. So i'm planing to make a DNA30 project that will have two 18650 Battery, pls correct me if i'm wrong, the correct way to connect this is like this img. option (B) and use 1x6Amp fuse or 2x3Amp fuse for each battery. I did see a lot of link's for a lot of fuses, so for a DNA30 what you guys advise me to use? Fusing for the DNA30 has been mentioned above. Total hold fusing should be 12A not 6A. Use option "B" but use two parallel 3A fuses for each battery. Thats 4 fuses that will total 12A hold rating. thanks my friend, i will try to find that fuses.